Department of Clinical Pharmacology and Therapeutics, Nizam's Institute of Medical Sciences, Panjagutta, Hyderabad, Telangana, India. ABSTRACT: Background: Hyperglycemia may induce endothelial dysfunction. Chromium Supplementation enhances endothelial relaxation and may improve endothelial dysfunction. Present study was planned to evaluate effect of proprietary chromium complex(PPC) and its individual components on endothelial dysfunction and lipid profile in type 2diabetics. Methodology: Study was done in two parts. In part I, PPC 400mcg produced significant improvement in endothelial function compared to PPC 200mcg and placebo. In part II, 96 eligible subjects were randomized to chromium chloride 400mcg, Phyllanthus emblica 6mg and Shilajit 6mg, chromium picolinate 400mcg, chromium polynicotinate 400mcg and chromium dinicocysteinate 400mcg and compared to PPC 400mcg. Efficacy parameters were change in endothelial function(>6% change in reflection index(RI), biomarkers of oxidative stress and lipid profile after 12weeks treatment. Laboratory safety parameters were measured at baseline and post treatment. Results: Total 96 subjects completed the study. PPC 400mcg produced better improvement in reflection index (−3.34%±1.00% to −7.23%±1.88% (p<0.001) compared to chromium chloride 400mcg (-3.79%±0.82 to-3.22%±0.85), Phyllanthus emblica 6mg and Shilajit 6mg (-1.44%±0.58 to-5.67%±0.54), chromium picolinate 400mcg (-4.68%±1.24 to -2.46%±0.90), chromium polynicotinate 400mcg (-4.3%±1.2to-3.71%±1.1), chromium dinicocysteinate 400mcg (-4.85%±0.74 to-3.82%±0.74). Further, PPC 400 mcg produced significant improvement of biomarkers of oxidative stress and lipid profile compared to other groups. All treatments were well tolerated. Conclusion: PPC 400 mcg showed significant improvement in endothelial function, lipid profile and biomarkers of oxidative stress in type 2 diabetics, followed by the combination of Phyllanthus emblica and Shilajit extracts, chromium picolinate, chromium polynicotinate, chromium dinicocysteinate and chromium chloride. Further, it can be inferred that PPC 400 mcg has significant synergistic activity. INTRODUCTION: Type 2 diabetes mellitus is described by variable degrees of insulin resistance, impaired insulin secretion and increased glucose production. It builds the danger of cardiovascular illness by two to fourfold. The risk is by and large credited to the adverse effects of hyperglycemia and oxidative stress on vascular biology. Vascular endothelial cells assume an important role in keeping up cardiovascular homeostasis. In addition to providing a physical barrier between the vessel wall and lumen, the endothelium secretes a number of mediators that regulate vessel tone, platelet aggregation, coagulation and fibrinolysis. The term endothelial dysfunction alludes to losing the propensity to promote vasodilation, fibrinolysis, and anti aggregation which are the physiological properties of endothelium1. Substantial clinical and experimental evidence recommend that both diabetes and insulin resistance cause a mix of endothelial dysfunction, which may reduce the counter atherogenic part of the vascular endothelium. Expanding proof recommends that the progression of insulin resistance to type 2 diabetes parallels the progression of endothelial dysfunction to atherosclerosis2. Intervention studies have provided a clinical evidence that there is a link between endothelial dysfunction and insulin resistance that demonstrated improved endothelial function following treatments that improve insulin sensitivity 3. Therefore, understanding and treating endothelial dysfunction is a major focus in the prevention of vascular complications associated with all forms of diabetes mellitus 4. Endothelial dysfunction results from decreased bioavailability of the vasodilator nitric oxide (NO), for the most part because of accelerated NO degradation by responsive oxygen species 5. Reactive oxygen species (ROS), for example, superoxide radicals, hydroxyl radicals, iron-oxygen edifices, hydrogen peroxide and lipid peroxides are generated by a few oxidative responses. Despite the fact that ROS can help the safe framework and wipe out extrusive microorganisms, unnecessary ROS can likewise respond with biological molecules, for example, DNA, proteins and phospholipids, and eventually cause oxidative harm in tissue and free radical-related diseases, for example, irritation, coronary illness, diabetes, gout, cancer, etc. 6. Current favored hypothesis is that oxidative stress, through a unifying mechanism of superoxide generation, is the regular pathogenic element prompting insulin resistance, β-cell dysfunction, impaired glucose tolerance (IGT) and eventually to type 2 DM (T2DM). Moreover, this mechanism has been embroiled as the fundamental reason for both the macrovascular and microvascular inconveniences associated with type 2 diabetes mellitus. It follows that therapies aimed at reducing oxidative stress would advantage patients with T2DM 7. Numerous herbs have strong anti oxidant, anti inflammatory and cardio-defensive properties and are utilized by patients with increased risk of cardiovascular morbidity and mortality. Phyllanthus emblica (Emblica officinalis, Euphorbiaceae) generally known as Indian gooseberry or "Amla", has been utilized as wellbeing sustenance since antiquated times in India and other Asian nations. The hypolipidemic, anti oxidant and cardioprotective activities of Phyllanthus emblica have been entrenched in both animals 8 and human clinical studies 9-14. Shilajit, a rock exudate containing dibenzo-α-pyrone chromoproteins and fulvic acids as bioactives, finds broad use in Ayurveda for different clinical applications. There are several lines of studies about Shilajit and its significance in the treatment of various diseases by health specialists and pharmacological associations. In a study with alloxan- induced diabetic rats, Shilajit essentially diminished blood glucose levels and enhanced the lipid profile 15. Supplemental chromium, as chromium picolinate, has been appeared to enhance the blood glucose, insulin, cholesterol, and glycosylated hemoglobin in individuals with Type 2 DM in a dose dependent manner 16-17. Other chromium supplements in the market sector incorporate chromium polynicotinate and chromium dinicocysteinate. However, many years of controversy continue regarding beneficial effects of chromium supplementation. 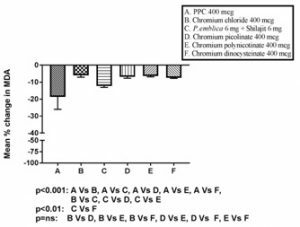 A new Proprietary Chromium Complex (PPC), containing chromium complexed with the polyphenolic compounds in the aqueous extract of Phyllanthus emblica fruits, and purified Shilajit to improve bioavailability of chromium, was introduced a few years ago. It was shown that this complex, at a dose of 200 µg twice a day, in a 150 subject clinical study in type 2 diabetics, decreased fasting blood glucose and post-prandial blood glucose levels significantly, when given in conjunction with oral anti-diabetic drugs 18. Since endothelial dysfunction is also associated with type 2 diabetes mellitus, the present study was undertaken to evaluate the effect of this Proprietary Chromium Complex at 200 mcg and 400 mcg per day doses on endothelial function in patients with type 2 diabetes mellitus in a prospective, randomized, placebo-controlled, double-blend clinical study. Following highly significant results with the 400 mcg dose, study was continued with the individual components of the proprietary chromium complex, i.e., chromium chloride, Phyllanthus emblica extract 6 mg + Shilajit extract 6 mg, and other chromium salts available in the market, i.e., chromium picolinate, chromium polynicotinate, and chromium dinicocysteinate, by enrolling more subjects. Objectives: The primary objective was a change in endothelial dysfunction as assessed by more than 6% change in reflection index at 12 weeks in all the treatment groups. Secondary objective was change in oxidative stress markers glutathione (GSH), malondialdehyde (MDA), serum levels of nitric oxide (NO), high-sensitivity C-Reactive Protein (hsCRP), glycosylated hemoglobin (HbA1c) and lipid profile at 12 weeks in all the treatment groups. Additionally, safety and tolerability assessment of the test medications were also conducted. Study Medications: The Proprietary Chromium Complex (Crominex®) 200 mcg, 400 mcg and placebo capsules for Part-I of the study and 400 mcg chromium chloride capsules, Phyllanthus emblica 6 mg + Shilajit 6 mg capsules, 400 mcg chromium picolinate capsules, 400 mcg chromium polynicotinate capsules and 400 mcg chromium dinicocysteinate capsules for Part-II of the study were supplied by Natreon, Inc., USA. Crominex® is prepared by complexation of chromium chloride with aqueous extract of Phyllanthus emblica fruits, which contains polyphenolic compounds Emblicanin-A, Emblicanin-B, Punigluconin and Pedunculagin, and purified Shilajit, which, by virtue of its liposomal fulvic acid content, increases the bioavailability of chromium. Microcrystalline cellulose is used as a carrier in the complex. Chromium chloride hexahydrate USP was purchased from American International Chemicals, USA. Chromium picolinate (Chromax®) was obtained from Nutrition 21, USA. Chromium polynicotinate (Chromemate®) and chromium dinicocysteinate (Zychrome®) were obtained from Interhealth Nutraceuticals, USA. Phyllanthus emblica extract (Capros®) and Shilajit extract (PrimaVie®) were from Natreon Inc., USA. Microcrystalline cellulose, NF from USA, Croscrmellose sodium, NF from USA, and Magnesium stearate, NF from USA were used as excipients. White opaque/white opaque hard gelatin capsules from Capsugel, USA were used. Study Procedure: The study was a prospective, randomized, double blind, placebo-controlled trial conducted in the Department of Clinical Pharmacology and Therapeutics, Nizam’s Institute of Medical Sciences, Hyderabad, India. The study was approved by the Institutional Ethics Committee. All subjects gave written Informed consent prior to participation in the study. The study was registered with Clinical Trials Registry-India (CTRI) and the Reference number is REF/2016/03/010880. Patients of either gender, aged 30-65 years, with fasting plasma glucose levels of 110-126 mg/dL, glycosylated haemoglobin (HbA1c) between 6.5 % and 8% and taking stable dose of anti-diabetic treatment (T. Metformin 1500-2000 mg/day) for the past 8 weeks prior to the screening visit; and having endothelial dysfunction defined as ≤ 6% change in reflection index (RI) on post salbutamol challenge test were included in the study. Patients with severe uncontrolled hyperglyceamia, uncontrolled hypertension, cardiac arrhythmia, impaired hepatic or renal function, history of malignancy or stroke, smoking, chronic alcoholism, any other serious disease requiring active treatment and treatment with any other herbal supplements, were excluded from the study. The study was done in two parts. In Part I, which was done earlier, a total of 72 subjects were screened and 60 eligible subjects were enrolled. They were randomized to receive either PPC 200 mcg, PPC 400 mcg or placebo one capsule once daily. Treatment with PPC 200 mcg and 400 mcg showed significant reduction in RI, suggesting improvement in endothelial function. Both PPC 200 mcg and 400 mcg had increased NO and GSH and decreased MDA and hsCRP levels significantly indicating improvement in biomarkers of oxidative stress. Improvement on lipid profile was also noted with both test formulations. It was observed that PPC 400 mcg showed significant improvement than PPC 200 mcg on all the above mentioned parameters. Thus, in Part-II of the study, which is the present study, PPC 400 mcg data (Group A) was compared with its individual components and other chromium compounds available in the market. In Part II of the study, 110 subjects were screened and 96 eligible subjects were enrolled. The subjects were randomized to receive one of the five treatments, one capsule once a day, for a duration of 12 weeks – Group B(n=19): one capsule of chromium chloride containing 400 mcg of chromium, Group C(n=20): one capsule of Phyllanthus emblica extract 6 mg + Shilajit extract 6 mg, Group D(n=19): one capsule of chromium picolinate containing 400 mcg of chromium, Group E(n=20): one capsule of chromium polynicotinate containing 400 mcg of chromium and Group F(n=18): one capsule of chromium dinicocysteinate containing 400 mcg of chromium. Subjects were followed up at 4, 8 and 12 weeks of therapy. At each visit they were evaluated for efficacy and safety. Pharmacodynamic evaluation for endothelial function was conducted at every visit. Blood samples were collected for evaluation of biomarkers before and at the end of the treatment. Safety lab investigations for hematological, hepatic renal and biochemical parameters were conducted before and at the end of the study and also as and when required, in case of any adverse drug reaction (ADR). Subjects were enquired for the presence of ADR and the same was recorded in the case report form. Compliance to therapy was assessed by pill count method. The primary efficacy measure was a change in endothelial dysfunction as reflected by a change in RI compared with baseline at 12 weeks in all the treatment groups. Secondary efficacy measures included changes in markers of oxidative stress, inflammation and lipid profile after 12 weeks in all the treatment groups. Procedure for Assessment of Endothelial Function: A salbutamol challenge test was done as per the method described by Chowienczyk et al., 19 and Naidu et al.,20 using digital volume plethysmograph. The height of the late systolic/early diastolic segment of the DVP was expressed as a rate of the amplitude of the DVP to yield the reflection index (RI), according to the methodology described by Millasseau et al., 21. After DVP recordings had been taken, three readings of reflection index (RI) were recorded and the mean value was obtained. Patients were then given 400 µg of salbutamol by inhalation. Following 15 minutes, three estimations of RI were obtained again and the difference in mean RI prior and then after administration of salbutamol was utilized for estimating endothelial capacity. A change of ≤6% in RI post salbutamol was considered as endothelial dysfunction. Biomarker Evaluation and Safety lab Assessments: Nitric oxide 22, MDA 23, and Glutathione 24 levels were estimated spectrophotometrically and hsCRP (high sensitivity C-reactive protein) by ELISA method. All the subjects underwent complete physical examination, safety lab evaluations at baseline and at the end of the treatment. Samples were collected after an overnight fast of 12hrs after the last dose of medication for determination of haemoglobin, HbA1c, blood urea and serum creatinine, liver function tests, lipid profile (total cholesterol, high density lipoprotein cholesterol (HDL-C), low density lipoprotein cholesterol (LDL-C) using standard laboratory techniques. Statistical Analysis: All the data were expressed as mean ±SD. Paired t- test and ANOVA were performed for within group and between groups analysis respectively. Post hoc analysis between the groups was done by Tukey’s test. A p-value < 0.05 was considered to be statistically significant. All statistical analyses were performed using the Graphpad PRISM Software 7 (GraphPad Software Inc., USA). RESULTS: Detailed demographic characteristics of the study groups are shown in Table 1. There was no significant difference between treatment groups in baseline characteristics including age, weight and body mass index indicating that the study population was homogenous with respect to demographic variables. The Reflection Index (RI) was used to assess endothelial function using Salbutamol Challenge test. 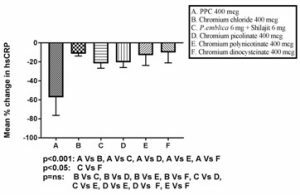 As shown in Table 2, there was statistically significant change in the reduction of RI after 12 weeks of treatment in PPC 400 mcg (A) (p<0.001), chromium chloride 400 mcg (B) (p<0.001), Phyllanthus emblica 6 mg + Shilajit 6 mg (C) (p<0.001), chromium picolinate 400 mcg (D) (p<0.001), chromium polynicotinate 400 mcg (E) (p<0.05), chromium dinicocysteinate 400 mcg (F) (p<0.01) when compared to baseline. # (p<0.001), $ (p<0.05) - compared to baseline. Levels of NO, GSH, MDA and hsCRP were used to assess biomarkers of oxidative stress. The Effect of study medications on biomarkers is shown in Table 3. It can be seen that there was a statistically significant increase (p<0.001) in NO, GSH levels and a statistically significant decrease (p<0.001) in MDA and hsCRP levels in all the treatment groups compared to baseline after 12 weeks of treatment suggesting improvement in oxidative stress. 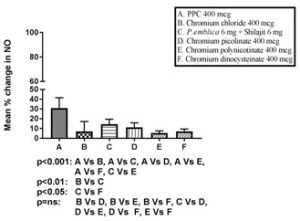 Further analysis showed that PPC 400mcg had a highly significant improvement followed by Phyllanthus emblica 6mg + Shilajit 6mg and Chromium picolinate 400mcg. # p<0.001, @ p<0.01 compared to pre-treatment in all treatment groups. Mean percentage changes for all the biomarkers were evaluated. The mean percentage increase in nitric oxide was 30.98%, 6.98%, 14.48%, 11.09%, 5.33%, 7.08% for PPC 400mcg, Chromium chloride 400 mcg, Phyllanthus emblica 6mg + Shilajit 6mg, Chromium picolinate 400mcg, Chromium polynicotinate 400mcg and Chromium dinicocysteinate 400 mcg, respectively compared to pre-treatment (Fig. 1). The mean percent increase in GSH was 21.71% in the PPC 400 mcg, 4.22% in the Chromium chloride 400 mcg , 8.95% in the Phyllanthus emblica 6 mg + Shilajit 6 mg, 7.20% in the Chromium picolinate 400 mcg, 5.33% in the Chromium polynicotinate 400 mcg, 5.77% in the Chromium dinicocysteinate 400 mcg, compared to pre-treatment (Fig. 2). The mean percentage reduction in MDA was 17.81%, 5.14%, 11.4%, 6.03%, 5.56%, 6.62% for PPC 400 mcg, Chromium chloride 400 mcg, Phyllanthus emblica 6mg + Shilajit 6mg, Chromium picolinate 400 mcg, Chromium polynicotinate 400 mcg and Chromium dinicocysteinate 400 mcg, respectively compared to pre-treatment (Fig. 3). The mean percent reduction in hsCRP was 55.83%, 9.92%, 20.15%, 18.9%, 11.45%, 8.61% for PPC 400mcg, Chromium chloride 400 mcg, Phyllanthus emblica 6 mg + Shilajit 6 mg, Chromium picolinate 400mcg, Chromium polynicotinate 400 mcg and Chromium dinicocysteinate 400 mcg, respectively compared to pre-treatment(Fig. 4). There is a significant improvement in HbA1c (%) with PPC 400 mcg (p<0.001) and Phyllanthus emblica 6 mg + Shilajit 6 mg group (p<0.05). All the treatment groups have shown a significant effect on the lipid profile. After 12 weeks of treatment, total cholesterol, LDL-C, triglycerides and VLDL were significantly decreased and HDL-C was significantly increased (Table 4). Compared to pre-treatment, mean percentage reduction in total cholesterol was 18.05%, 0.28%, 1.68%, 0.99%, 0.68%, 0.38% respectively for PPC 400 mcg, Chromium chloride 400 mcg, Phyllanthus emblica 6mg + Shilajit 6mg, Chromium picolinate 400mcg, Chromium polynicotinate 400mcg and Chromium dinicocysteinate 400 mcg. The mean percent reduction in triglyceride levels compared to pre treatment were 25.41%, 0.49%, 1.46%, 0.58%, 0.68%, 0.37% for PPC 400mcg, Chromium chloride 400 mcg, Phyllanthus emblica 6 mg + Shilajit 6mg, Chromium picolinate 400 mcg, Chromium polynicotinate 400 mcg and Chromium dinicocysteinate 400 mcg respectively. The mean percent reduction in LDL-C levels for PPC 400mcg, Chromium chloride 400 mcg, Phyllanthus emblica 6 mg + Shilajit 6 mg, Chromium picolinate 400mcg, Chromium polynicotinate 400 mcg and Chromium dinicocysteinate 400 mcg were 27.7%, 1.3%, 3.48%, 2.35%, 0.38%, 0.81% respectively. And the mean percent increase in HDL-C levels for PPC 400 mcg, Chromium chloride 400 mcg, Phyllanthus emblica 6 mg + Shilajit 6 mg, Chromium picolinate 400 mcg and Chromuim dinicocysteinate were 27.34%, 2.79%, 3.52%, 2.96% and 1.19% respectively. # p<0.001, @ p<0.01, $ p<0.05, NS: not significant - compared to pre-treatment. There were no significant changes in vital, hematological, renal and hepatic functions with all treatments after 12 weeks of treatment as compared to pretreatment (baseline). All subjects tolerated study medication well. emerging as a key component in the pathophysiology of the cardiovascular abnormalities associated with diabetes mellitus. Other risk factors associated with impaired endothelial function are dyslipidemia, hypertension and smoking 25. Diabetes mellitus well impairs the vasodilating properties of the endothelium and leads to endothelial dysfunction, which can thus be considered the primary step in the progression of cardiovascular disease 26. Importantly, endothelial dysfunction has been shown to be of prognostic significance in predicting vascular events, so endothelial function testing may potentiate the detection of cardiovascular diseases such as myocardial infarction, peripheral vascular disease, ischemic stroke, and others 27. In an earlier study, we reported the presence of endothelial dysfunction assessed by salbutamol challenge indicating a decrease of < 6% in RI, which is a marker of endothelial-dependent vasodilatation in diabetic patients 28, 29. In the present study compared to all other groups, PPC 400mcg produced significant reduction in reflection index, followed by Phyllanthus emblica 6mg+Shilajit 6mg and Chromium picolinate 400mcg after 12 weeks of treatment suggesting improvement in endothelial function. The intact endothelium promotes vasodilatation principally via the release of nitric oxide which is also known as endothelium-derived relaxing factor. Nitric oxide has been recognized as a major determinant of vascular homeostasis, regulating several physiologic properties, including vascular permeability, and has antithrombotic properties. Decreased production or increased metabolism of nitric oxide may lead to inadequate amounts of nitric oxide within the vasculature and its pathobiologic consequences. The endothelial dysfunction seen in diabetes has been linked to a lack of bioavailable nitric oxide due to reduced ability to synthesize nitric oxide from L-arginine 30. In the present study, all the treatments significantly increased nitric oxide levels after 12 weeks of treatment but PPC 400 mcg was good compared to others. Studies have shown that chromium (III) was capable of up-regulating insulin-stimulated insulin signal transduction via affecting downstream molecules of the IR, as evidenced by enhanced levels of tyrosine phosphorylation of IRS-1. The increased IRS-1 phosphorylation led to increased insulin receptor sensitivity, thus causing greater uptake of glucose 31. In a study, Kleefstra and other coworkers administered 400 mcg of Cr daily as chromium yeast over 6 months, and monitored the subjects for HbA1c levels, BMI, blood pressure, lipid profile, body fat and insulin resistance. The study could not show that chromium supplementation has effect on glycemic control in Western patients 32. Chromium supplementation with brewer's yeast may provide marginal benefits in lowering fasting plasma glucose in patients with T2DM compared to placebo however it did not have any effect on HbA1C 33. In present study, treatment with PPC 400 mcg for 12 weeks showed significant reduction in HbA1c levels compared to baseline. In a study, Shinde et al., has seen the effect of chromium chloride on the glucose and lipid metabolism in diabetic rats given for 6 wks which showed that it exhibited significant anti-diabetic potential in chemically-induced diabetes in rats. The probable mechanism may be potentiation of insulin actions at the target tissues leading to improved peripheral insulin sensitivity 34. Uusitupa et al., demonstrated a positive effect at 200 mcg of the Chromium chloride salt on glucose tolerance, insulin response and serum lipids. However, the remaining variables were not altered by supplemental chromium 35. In our study, Chromium chloride did not demonstrated significant effect on HbA1C but it showed significant effect on biomarkers of oxidative stress. Chromium picolinate has been listed as one of most attractive health supplements to attenuate T2DM in western countries 36. Anderson et al had seen that Chinese patients with type 2 diabetes receiving Chromium Picolinate have experienced significant improvements in HbA1c, fasting and post prandial blood glucose and fasting and 2-h insulin 37. In another study, the effectiveness of the 1000 mcg of Chromium picolinate was reproduced in Chinese population with metabolic syndrome 38. In our study, Chromium picolinate did not demonstrated significant effect on fasting blood glucose and HbA1C but it showed significant effect on biomarkers of oxidative stress. Jain et al., in their study supplemented type 2 diabetics with Chromium dinicocysteinate which lowered insulin resistance by reducing blood levels of insulin, TNF-α and oxidative stress in type 2 diabetic subjects. So they concluded that it can be a potent adjunct therapy in type 2 diabetics 39. In our study, Chromium dinicocysteinate did not demonstrated significant effect on HbA1C but showed significant effect on biomarkers of oxidative stress. Dyslipidemia is widely established as an independent risk factor for cardiovascular disease 40. Reduction of hypercholesterolemia has been associated with improvement of coronary artery disease and intensive interventions, including diet, exercise, and use of hypolipidemics and anti-inflammatory drugs, are recommended. However, some patients need safer therapeutic alternatives because they cannot tolerate the adverse effects of these drugs 41. In this study, we found that 12 weeks of treatment with PPC 400 mcg achieved a significant improvement in the lipid profile compared to other treatment groups. C-reactive protein is a sensitive marker for systemic inflammation. It has been recently demonstrated that there is relation between inflammation and development of atherosclerotic disease, particularly in coronary heart disease, However, it is not clear whether elevated CRP levels are merely a phenom­enon accompanying atherosclerosis or if it itself is involved in the initiation and/or progression of atherosclerosis 42. In our study, 12 weeks of treatment with PPC 400 mcg significantly reduced high sensitivity C-reactive protein levels (hsCRP), suggesting its beneficial effects via reducing systemic inflammation and acting as oxygen free radical scavengers, thereby improving endothelial function. CONCLUSION: Endothelial dysfunction is a potential contributor to the pathogenesis of vascular disease in diabetes mellitus. It may be due to decreased bioavailability of nitric oxide and increased oxidative stress. PPC 400 mcg improved endothelial function, biomarkers of oxidative stress and lipid profile in type 2 diabetics and it appears to have a significant synergistic activity. 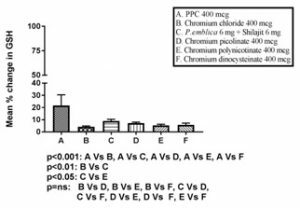 In addition, PPC 400 mcg proved to be more efficacious in the parameters tested among all the chromium products studied. This was followed by the combination of Phyllanthus emblica and Shilajit extracts (the two other components in the complex), chromium picolinate, chromium polynicotinate, chromium dinicocysteinate. However, extensive clinical studies are warrented in larger number of patients to establish the efficacy and safety of Proprietary Chromium Complex in the manage­ment of endothelial dysfunction in type 2 diabetes mellitus patients. ACKNOWLEDGMENTS: The authors thank Natreon Inc., NJ, USA for providing the study medications and placebo used in this study, kits for biomarker estimation and relevant literature. The authors thank Dr. I.V. Sravanthi, Ayurvedic physician, for her expert advice. CONFLICT OF INTEREST: No conflicts of interest. Avogaro A, Mattia Albiero M, Lisa Menegazzo L et al. : Endothelial Dysfunction in Diabetes, The role of reparatory mechanisms. Diabetes Care. 2011; 34(2): 285 - 290. Ketete M, Cherqaoui R, Abid R. Maqbool, Kwagyan J et al. : Endothelial dysfunction: The contribution of diabetes mellitus to the risk factor burden in a high risk population. J. Biomedical Science and Engineering. 2013; 6: 593-597. Suganya N, Bhakkiyalakshmi E, Sarada DV, Ramkumar KM. Reversibility of endothelial dysfunction in diabetes: role of polyphenols. Br J Nutr. 2016; 116(2):223-46. Roberts AC, Porter KE. Cellular and molecular mechanisms of endothelial dysfunction in diabetes. Diab Vasc Dis Res. 2013; 10(6):472-82. Nathan C, Amy Cunningham B: Beyond oxidative stress: an immunologist's guide to reactive oxygen species. Nature Reviews Immunology. 2013; 13: 349-361. Nishat Fatima, Usharani Pingali, N. Muralidhar. Study of pharmacodynamic interaction of Phyllanthus emblica extract with clopidogrel and ecosprin in patients with type II diabetes mellitus. Phytomedicine. 28; 21(5): 579-85. Broadhurst CL, Domenico P. Clinical studies on chromium picolinate supplementation in diabetes mellitus--a review. Diabetes Technol Ther. 2006; 8(6): 677-87. Tuhin Biswas K., Gobinda Polley, Srikanta Pandit, Debnath K. Pratip, Mondal Somoresh, Auddy Biswajit et al. : Effects of adjunct therapy of a proprietary herbo-chromium supplement in type 2 diabetes: A randomized clinical trial. Int J Diab Dev Ctries, 2010; 30(3): 153-161. Chowienezyk PJ, Kelly RP, MacCallum H, Millasseau SC, Tomas LG A, Gosling RG. : Photoplethysmographic assessment of pulse wave reflection: blunted response to endothelium dependent beta2-adrenergic vasodilation in type II diabetes mellitus. J of American College of Cardiology.1999; 34(7): 2007-2014. Naidu MUR, Sridhar Y, Usha Rani P, Mateen AA. Comparison of two β2 adrenoceptor agonists by different routes of administration to assess human endothelial function. Indian J Pharmacol.2007; 39 (3):168-169. Millaesseau SC, Kelly RP, Ritter JM, Chowienczyk PJ. Determination of age related increases in large artery stiffness by digital pulse contour analysis. Clinical Science.2002; 103: 371-377. Katrina MM, Michael GE, David AW. A rapid, simple spectrophotometric method for simultaneous detection of nitrate and nitrite. Biology and Chemistry. 2001; 5(1): 62–71. Vidyasagar J, Karunaka N, Reddy MS, Rajnarayan K, Surender T, Krishna DR. Oxidative stress and antioxidant status in acute organophosphorous insecticide poisoning. Indian J of Pharmacol.2004; 36(2): 76-79. Elman GL. Tissue sulfhydryl groups. Arch Biochem Biophys. 1959; 82: 70–77. Assunta P, Elena A. Chronic hyperglycemia and nitric oxide bioavailiability play a pivotal role in pro-atherogenic vascular modifications. Genes Nutr. 2007; 17: 195–208. Gopi Krishna Kolluru, Shyamal C. Bir, andChristopher G. Kevil. Endothelial Dysfunction and Diabetes: Effects on Angiogenesis, Vascular Remodeling, and Wound Healing. 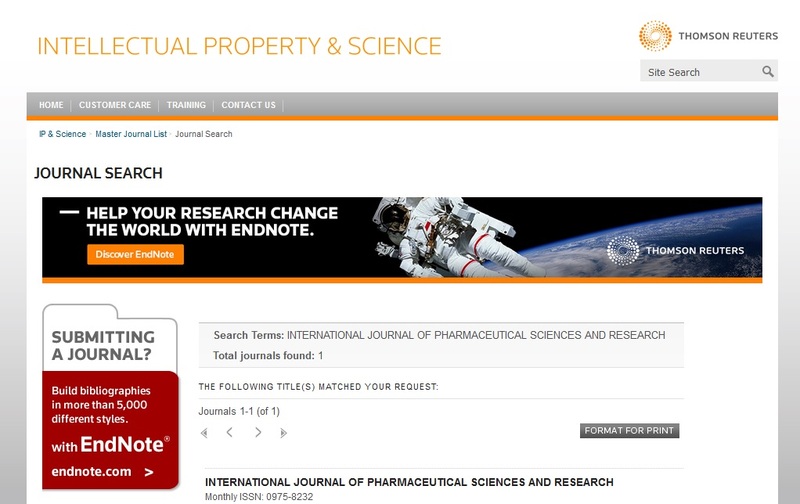 International Journal of Vascular Medicine.2012; Article ID 918267, 30 pages. Naidu MUR, Sridhar Y, Usharani P, Mateen AA. Comparison of two β2adrenoceptor agonists by different routes of administration to assess human endothelial function. Indian J Pharmacol. 2007; 39:168–169. Usharani P, Mateen AA, Naidu MU, Raju YS, Chandra N. Effect of NCB-02, atorvastatin and placebo on endothelial function, oxidative stress and inflammatory markers in patients with type 2 diabetes mellitus: a randomized, parallel-group, placebo-controlled, 8-week study.Drugs R D. 2008; 9: 243–250. Duncan B, Meeking D, Kenneth S, Cummings M. Endothelial dysfunction and pre-symptomatic atherosclerosis in type 1 diabetes – pathogenesis and identification.Br J Diabetes Vasc Dis. 2003; 3: 27–34. Kitamura, Masanori.Endoplasmic reticulum stress and unfolded protein response in renal pathophysiology: Janus faces. 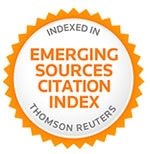 American Journal of Physiology (American Physiological Society) .2008; 295(2): 323–334. Kleefstra, N, Houweling, S. T, Bakker, S. J. L, Verhoeven S, et al., Chromium Treatment Has No Effect in Patients with Type 2 Diabetes in a Western Population: A randomized, double-blind, placebo-controlled trial. Diabetes Care. 2007;30 (5): 1092–1096. Yin RV, Phung OJ. Effect of chromium supplementation on glycated hemoglobin and fasting plasma glucose in patients with diabetes mellitus. Nutr J.2015; 13:14-18. Shinde Urmila A, Sharma G, Xu Yan J, Dhalla Naranjan S, Goyal Ramesh K. Anti-diabetic activity and mechanism of action of chromium chloride. Exp Clin Endocrinol Diabetes.2004; 112(5):248-52. Peng M, Yang X. Controlling diabetes by chromium complexes: The role of the ligands. J Inorg Biochem.2015; 146: 97-103. Paiva AN,Lima JG, Medeiros AC, Figueiredo HA. Beneficial effects of oral chromium picolinate supplementation on glycemic control in patients with type 2 diabetes: A randomized clinical study. J Trace Elem Med Biol. 2015; 32: 66-72. Jain SK, Kahlon G, Morehead L, Dhawan R, Lieblong B, Stapleton T, et al. : Effect of chromium dinicocysteinate supplementation on circulating levels of insulin, TNF-α, oxidative stress, and insulin resistance in type 2 diabetic subjects: randomized, double-blind, placebo-controlled study. Mol Nutr Food Res.2012; 56(8): 1333-41. Namita Mahalle, K. Garg, Sadanand S. Naik, and Mohan V. Kulkarni. Study of pattern of dyslipidemia and its correlation with cardiovascular risk factors in patients with proven coronary artery disease. Indian J Endocrinol Metab. 2014; 18(1): 48–55. Maji D, Shaikh S, Solanki D, Gaurav K. Safety of statins.Indian Journal of Endocrinology and Metabolism. 2013; 17(4): 636-646. Shrivastava A K, Singh H V, Raizada A, Sanjeev S K et al. : C Reactive Protein and Coronary Heart Disease. The Egyptian Heart Journal.2015; 67(2): 89-97. Usharani P, Devi CG, Kishore KK and Kumar CU: Effect of proprietary chromium complex and its individual components versus chromium picolinate, chromium polynicotinate and chromium dinicocysteinate on endothelial function, biomarkers and lipid profile in type 2 diabetics - a randomized, double-blind, placebo-controlled study. Int J Pharm Sci Res 2017; 8(5): 2267-76. doi: 10.13040/IJPSR.0975-8232.8(5).2267-76. Authors Address: Department of Clinical Pharmacology and Therapeutics, Nizam's Institute of Medical Sciences, Panjagutta, Hyderabad, Telangana, India.